When sailors set out from various tropical ports, they might have benefited from the trade winds at their back. But sometimes these captains would find themselves in an area of the ocean known as "the doldrums." The doldrums are a part of the Pacific Ocean notorious for lack of wind; sailors of old times used the term to refer to the areas where, if supplies were running low, lack of wind could spell hard times - or even doom - for an expedition. It was referred to in Samuel Taylor Coleridge's "Rime of the Ancient Mariner:"
"the south wind that had initially led them from the land of ice now sends the ship into uncharted waters near the equator, where it is becalmed." While I follow a variety of technical analysts, I find that the recent consensus for Bitcoin, XRP, and the entire crypto market is that the bulls are back. 2 3 4 This is the part of the story where, of course, I lean over and knock on wood for good luck; I'm quite bad at predicting short-term price movements. However, I know that I've positioned my portfolio with the best digital asset in the market - and I'm looking forward to the remainder of 2018! If you're looking for a video that explains the benefits of both Ripple solutions - and XRP - in under five minutes, this video is for you. 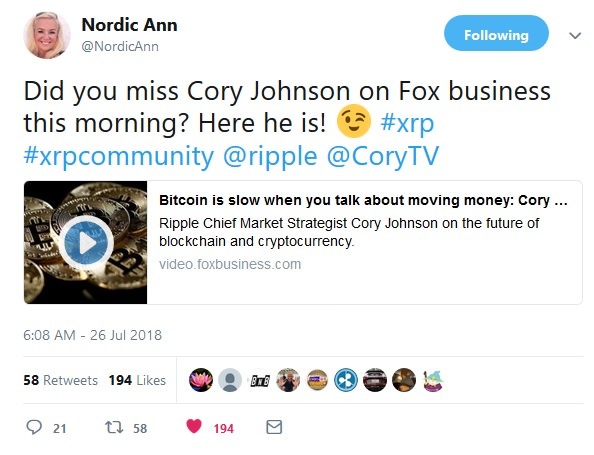 Cory Johnson provides a great high-level explanation that business users can understand; it's this type of content that is valuable for communicating the benefits of XRP - and Ripple solutions as well - to new audiences. The message is one data point that indicates incredible demand for the new crypto exchange; while it may take a bit of time, I expect that SBI VC will significantly increase volume for XRP over time, due to the fact that its participants may represent new demographic groups than are ordinarily represented by the crypto market. 8.5 million + (Unknown number of new customers) > 3.5 million current crypto traders in the entirety of Japan. "When we do it, it will be number one in the blink of an eye..."
It's a bold prediction. From what I've seen, traditional retail investors will need a bit of time to acclimate to the choices and options involved before diving in headlong. Even so, if even half of those customer estimates are accurate, I predict we can expect to see material levels of volume develop in the near future from SBI Virtual Currencies. The quarter two report was what I expected. For those that own and trade in XRP, the overriding consideration is how Ripple's interaction with the XRP market affects the overall supply. And we can see from the last column - Basis Points - that this interaction is consistent quarter-over-quarter. Essentially, the lower the number, the more narrow that demand is channeled to those traders like you and me that own XRP. However, do not forget that the ecosystem is a two-way street. As much as we'd like to see more demand be selectively addressed by retail traders, it's wise to remember that as Ripple obtains cash through direct sales it has consistently used this amount to invest in more XRP ecosystem booster programs, and that benefits the demand far greater than any loss of an individual basis point. 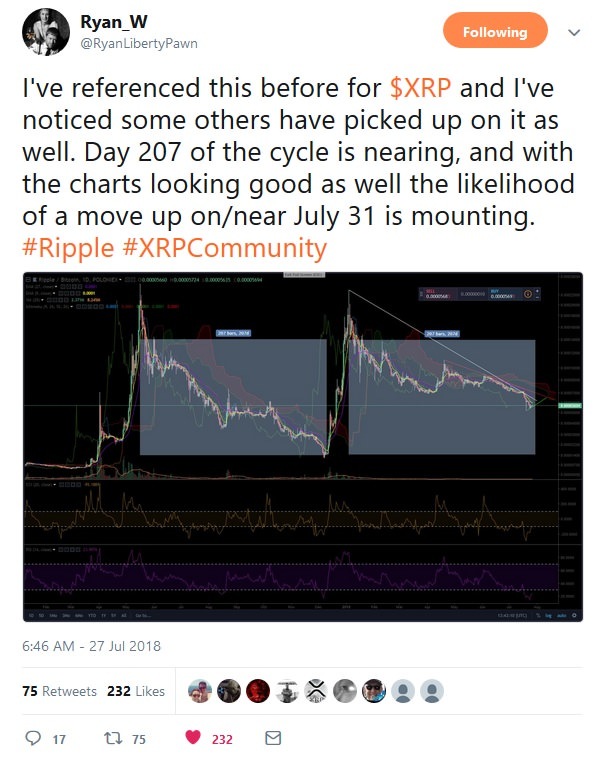 I fail to understand the lack of vision that is displayed by those that look at only the shallow increases or decreases in Ripple retail sales. Remember - Ripple hasn't used these direct sales to pay dividends to its shareholders; it's consistently used this XRP to make investments in companies, funds, and even philanthropic organizations that benefit the entire XRP ecosystem. For those that may not have a finance background, the basic concept here is that Ripple is highly motivated to seek out a higher price for XRP, since this not only affects Ripple's company valuation based on its XRP reserves but also because it directly affects the bottom line results of business for each quarter - in a very direct way in terms of cash position. This is a good thing for XRP owners. The more that a large company is rewarded by a higher priced, limited-quantity resource like XRP, the better off are the other owners of that same resource. "As the industry matures and decides what it deems most useful and valuable, we should expect to see more separation." "... South Korea’s trading had fallen to fourth in global share..."
It's a positive signal that XRP volume is now comprised of a much more diverse set of countries instead of being driven by one major geographic focal point. "Ripple having its best quarter ever in Q2 — in terms of customers signed." Nomura became the first bank to offer custody services for digital assets." Regardless of whether these large players - or a subset of them - end up supporting XRP, when the amount of overall crypto liquidity increases, it inevitably benefits all market participants - including XRP. 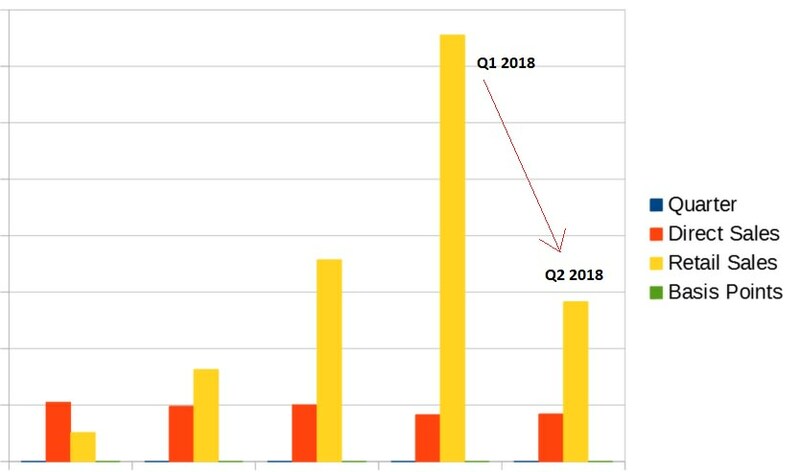 The quarter two report did an exceptional job of communicating the most important and salient points about XRP market activity, and also included some intriguing notes about future market direction. Kudos to Miguel Vias and Cory Johnson for this report - it covered all aspects of the XRP market for quarter two and provided valuable insight about future direction. Rob Sattler, an Australian cryptocurrency trader, investor and journalist, recently penned a detailed review where he analyzed the differences between Ethereum and Codius. 16 17 While I've also blogged on that topic, Rob Sattler's article is an even more detailed treatise, and I recommend it for anybody that wants to keep up to date on where the fintech market is heading with regards to smart contracts. Ethereum supporters should know that, despite the article's very pro-Codius stance, the author gives due credit to Vitalik Buterin in his own right; and rightly so - Vitalik Buterin's place in history has already been achieved with what many in crypto call the "world computer." "During his time at Ripple, Stefan and co-creator Evan Schwartz not only created Interledger (a set of open protocols for transferring payments across any ledger), they also designed a new way to run smart contracts called Codius, solving many of the issues that Ethereum now faces. With infinite scalability, it’s fundamentally a smart contract platform that could knock Ethereum off the Top 10 cryptocurrency list (without even being a cryptocurrency)"
"IT industry stalwarts such as IBM are offering Blockchain-as-a-Service now to customers, but without a way for those chains to seamlessly communicate with other blockchains and payment providers, they’re essentially ‘data islands’ in many cases. Codius was designed to solve this problem." The crypto market needs more impartial journalists to cover the facts behind blockchain technology and accurately assess the strengths and weaknesses of different solutions as Rob Sattler has done in this article. TransferGo is a popular remittance processor that supports sending money to various countries throughout Europe. In October of 2017, they became a member of RippleNet, which is Ripple's network of banks and financial institutions that have begun using ILP-based solutions to settle payments across borders. “We’ve launched this cryptocurrency trading facility in response to demand from our user base. How many users does TransferGo have? Roughly 650,000. This is exciting not just from a liquidity standpoint for XRP, but also because users may now experience how fast they can send value using XRP. This is an exciting and recent development for the XRP ecosystem, and for cryptocurrency adoption generally. Bitrue is an exchange based in Singapore. They are relatively new, but because of their niche and growing market in the Asian - Singapore corridor, they may be facing very fast growth in the coming days. Singapore has become a leader in all things blockchain and crypto recently, with its streamlined legislation and crypto-friendly approach. Question: Will Bitrue have API support at launch, and if 'no', then can Bitrue provide an estimated date for API support? Answer: We will, we are working on it and it will be ready soon. Question: Will Bitrue be participating in Ripple's incentive program - i.e. Xpring? Answer: Not for now, but we’ll consider any activities that is mutually beneficial to our users and our community development. Question: Will Bitrue integrate xRapid? Answer: We are intent to do that but it’s still under discussion. One thing very important is we will enable fiat currency by the end of the year in some countries and will put XRP again as base token to trade fiat. And we will have our API ready soon next month so xRapid can integrate our API to enable itself. Question: Can Bitrue elaborate on the concept of "base pair" - i.e., what does that mean? Answer: We see the value of XRP and like to treat it like BTC as base token. We will put XRP as base token to pair the others on our exchange as many as possible. Question: Who is the founder of Bitrue? Answer: Curis Wang is the CEO of Bitrue exchange, which he co-founded in 2018 with an ambition to develop the most trustworthy crypto trading platform. Prior to starting Bitrue, Wang has more than ten years experience working in the high tech and mobile internet industry. He was the head of the business development department at Cheetah Mobile and was responsible for that company’s worldwide business development, ecosystem establishment and app developers' community development. Curis is also a passionate crypto and blockchain lover, he has co-established Bitrue Space, an incubator to support promising blockchain start-ups such as Quarkchain. Curis holds an M.S. in Computer Science and Information Engineering at National Taiwan University. Question: Does Bitrue have insurance for assets on the exchange? Answer: we will cover the full lost of users’ assets if it’s due to our own system bug or breach. Answer: We will soon launch an XRP airdrop campaign and referral program to encourage XRP trading in early August. The campaign details are under discussion. As I've said in previous blogs, XRP owners should strongly consider supporting those businesses that promote and support XRP; this includes retail businesses that accept XRP (and crypto generally), and also exchanges such as Bitrue that use XRP as the most logical choice for fiat and crypto pairings. XRP transfers value to and from exchanges in under four seconds, and from that perspective it's the best choice for the entire crypto market. It's only a matter of time now before other exchanges see the benefit of speedier deposits and withdrawals due to XRP's role as their 'gateway' digital asset. 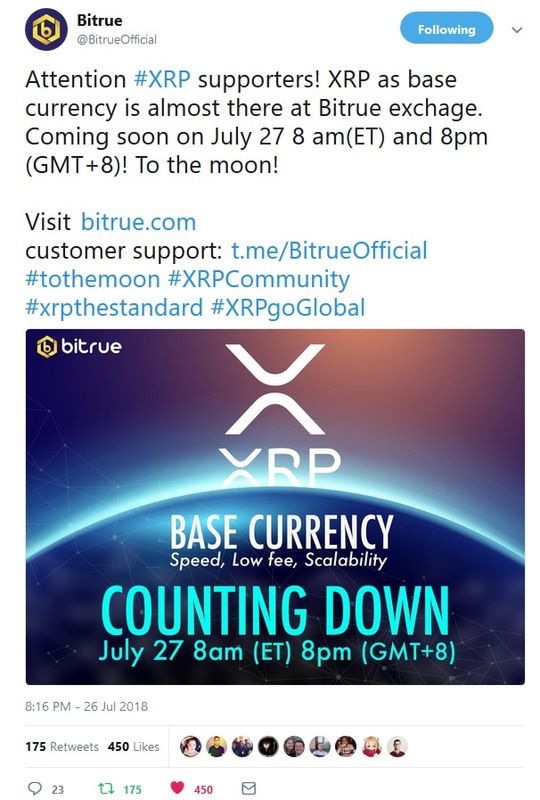 I want to thank Bitrue for choosing XRP as their base currency, and especially for taking the time to answer these detailed questions; I wish them luck and hope to see them become one of the top cryptocurrency exchanges. Uphold continues to make strides in supporting XRP. 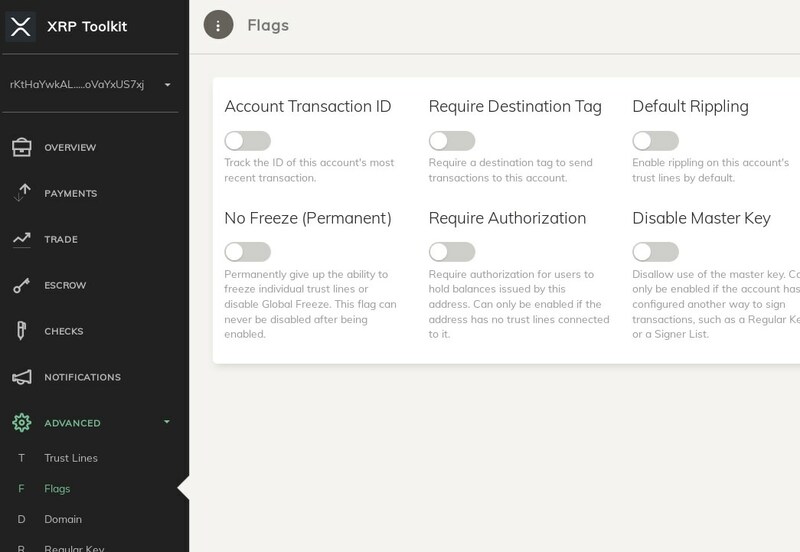 I hope that Uphold also eventually integrates ILP-based solutions to speed up the deposit of funds from bank accounts: It would be great to see Uphold be a pioneer in using xCurrent to process transfers from customers' banks. Indeed, however, the first phase shall encompass deposits and transactions only in EUR. The fee structures and cryptocurrency pairings can be found at the exchange's website here: Blocktrade crypto-fiat pairings and Blocktrade fee structure. For more information, please contact Secure Block Chains directly on Twitter, or visit their website. NOTE: I do not endorse any specific crypto wallet; please do your own due diligence. RareData (Reddit & XRP Chat Avatar), a prolific XRP Community Architect & Developer, recently released an interesting project that he calls the XRP Toolkit. I'm enthusiastic about Wirex because it's a full-fledged banking service for crypto market participants, no matter which cryptocurrencies they own. And for XRP owners, it's even more exciting, because we can use our XRP to pay for purchases, thereby adding even more demand for the highest-performing digital asset. We are setting sail for new shores in the crypto market. The doldrums may have been a sore test for some investors, but those that managed to wait out the tough times may be in store for a much more promising next part of 2018; while nobody can predict the future, the indications are that blockchain technology - and the digital assets built on it - are here to stay. Like a clipper ship unfurling its sails to catch the wind, the XRP Ledger's liquidity has expanded to include dozens of new exchanges, and the most recent ones are remarkably massive; SBI VC and its traditional finance cousins are poised to facilitate the entry of those mainstream retail investors that have so far been reluctant to trust crypto-only exchanges. What does this mean for the market capitalization of crypto as the second half of 2018 gets under way at pace? I predict momentum across the board for all digital assets, but especially for the one that mainstream investors will find is championed by the most promising set of companies in the fintech arena: XRP.